The second round of PARCC testing begins on Monday. If you have had enough of testing, here are five things you can do and three options are really FUN! 2) Send a letter to your school board members requesting your district apply for a PARCC waiver. TWENTY districts have already submitted their waiver request. 3) Contact your legislators and ask them to withdraw from PARCC and direct time and money to kids and classrooms. 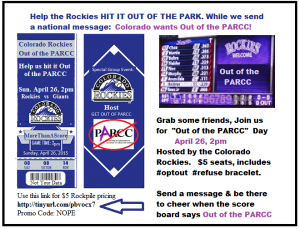 Colorado does not want to be one of the seven states taking PARCC. We want to be one of the Forty three states that are NOT taking PARCC. 4) Share this PARCC Fact Sheet with your contacts (Pass them out at school, attach to car windshields at sporting events, post to Facebook and Twitter, send through email, include in your birthday invites. 5) Join us for a day of fun at a Colorado Rockies game where we knock PARCC out of the Park and out of Colorado. Watch the big screen for a special message. Ticket details are below. Get the Facts – Withdrawing from PARCC does not result in a loss of funding. It saves money! Oklahoma and Indiana have repealed common core and PARCC, with No Loss of federal funds. 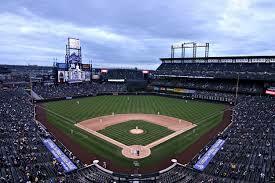 Colorado Rockies baseball is hosting a day for OUT of the PARCC!! Thank you for attending the parents press conference at the capitol! The message is spreading!